The numbers of breeding hen harriers, one of England’s rarest birds and a protected species, dropped sharply in the late 1990s and early 2000s. To better understand why hen harriers were vanishing, researchers tracked the movements of 58 birds using satellite-based tags in conjunction with remote sensing land management data. Birds with tags that stopped transmitting spent their last week of life predominantly on moors where hunters shoot grouse and were 10 times more likely to disappear or die when grouse moors dominated their ranges, suggesting they were killed. The findings indicated that 72 percent of the tagged harriers were either confirmed or considered very likely to have been illegally killed. Gliding over the moors of England in search of prey, the hen harrier (Circus cyaneus) may never have suspected it would itself fall prey to a greater predator—man. Scientists have found evidence that the disappearance of a large number of hen harriers in the UK may be linked to their being killed illegally over areas managed for grouse hunting. A hen harrier (Circus cyaneus) soars over the landscape. Image by Imran Shah via Wikimedia Commons, CC 2.0. “It has long been suspected that hen harriers were subject to illegal killing on the grouse moors of England,” said Arjun Amar, an avian conservation biologist at the University of Cape Town in South Africa and one of the authors of a recent study that investigated the reasons for hen harrier disappearances. The study was a collaboration among researchers from the University of Cape Town, Aberdeen University, Natural England—the government agency responsible for conservation in England, and the Royal Society for the Protection of Birds (RSPB) Scotland. The numbers of breeding hen harriers, raptors that are one of England’s rarest birds and a protected species, dropped sharply in the late 1990s and early 2000s. In response, Natural England launched a study to understand the reasons for this decline. Amar and colleagues worked on a part of this study to understand why so few hen harriers were coming back to their nesting areas, and what was happening to the birds that did not return. Red grouse (Lagopus lagopus scotica) such as this one are hunted by both hen harriers and people. Gamekeepers and hunters kill harriers and other non-human predators of grouse to bolster numbers for recreational hunting. Image by Dunpharlain via Wikimedia Commons. The moors are also popular among red grouse (Lagopus lagopus scotica) hunters, who shoot grouse during the hunting season that runs from August to December. The moorlands are open wet grasslands managed to ensure large populations of grouse are always available to hunters. To make sure grouse thrive on their lands, some gamekeepers kill its non-human predators, including hen harriers. A 2010 survey of hen harriers in the UK found that their populations declined by nearly 20 percent from 2004, with an estimated 662 breeding pairs remaining. Although there is no direct evidence for the illegal killing of hen harriers to support grouse shooting, the argument has been put forth many times. As far back as 1997, one study reporting the breeding success of female hen harriers in Scotland between 1988 and 1995 found that more birds survived in other moorlands than in grouse moors and between 11 and 15 percent of the total breeding population died. The authors attributed the deaths to illegal killings by humans. It is not easy to find evidence of such crimes because of the limited availability of data, the question of how to get the appropriate data, the occurrence of the crime in remote areas, and the destruction of possible evidence. To seek clues, Amar and team fitted satellite-based tracking tags on 60 harriers and geographically referenced the birds’ locations using remotely sensed land management data. 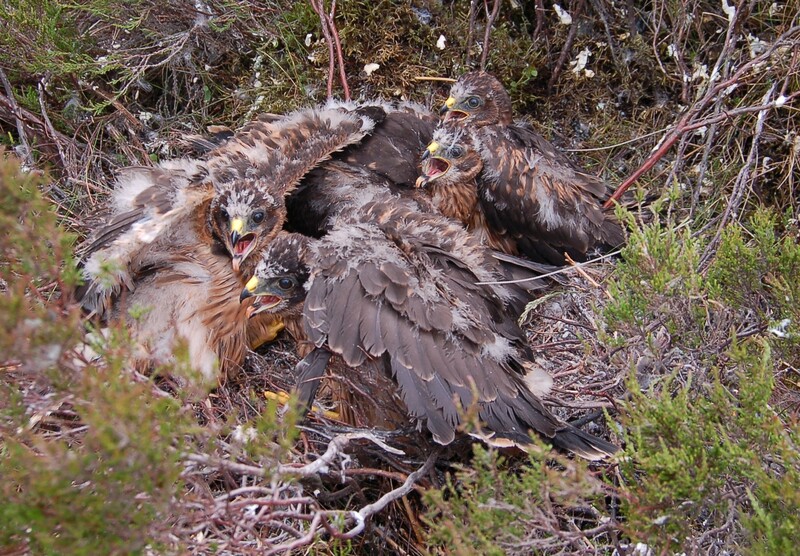 A brood of hen harrier nestlings, two of which were equipped with satellite transmitters for this study. Image by Peter Davies. 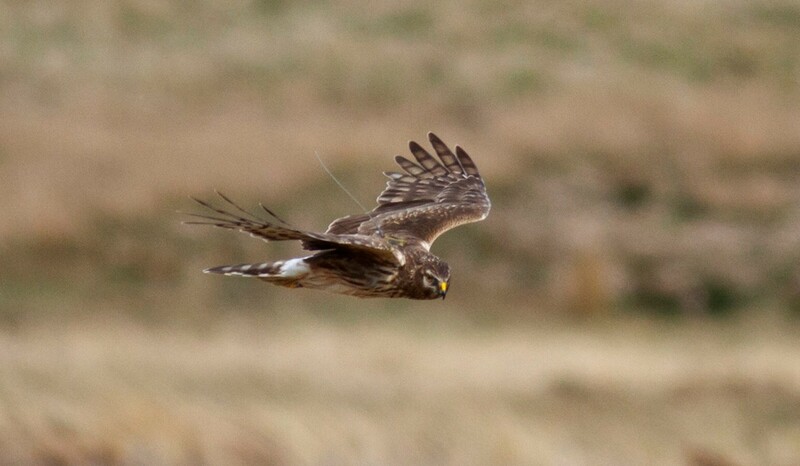 Trained volunteers scouted hen harrier breeding grounds, which include grouse moors, grasslands, bogs, and other open areas, and fitted month-old hen harriers with satellite transmitters and individual identity tags. Sixty fledglings across England and Scotland were fitted with transmitters between 2007 and 2017. 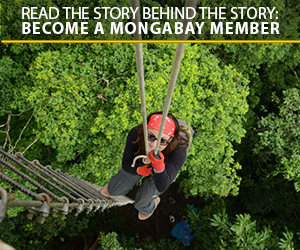 Tracking the birds with transmitters allowed the scientists to follow each individual’s movements on a regular basis. The transmitters sent the birds’ location data to the Argos satellite system, which received location data roughly every three days. Argos processes the information using a Doppler shift method and returns coordinates of the birds’ locations. If the transmitters stopped sending data and the (presumably dead) birds were not recovered, the team used clues from the last location and any other diagnostic information to figure out what happened to the birds. Statistical analysis of all the transmitter data, together with land use information gleaned from satellite imagery, allowed the researchers to tease out further clues about the last days of the dead birds. Of the 60 tagged birds, only 7 were alive, with transmitting tags, at the end of October 2017, and 72 percent were confirmed or suspected of being illegally killed. The rest either died of natural causes or their transmitters malfunctioned. Through these analyses, one piece of information stood out. Birds that were killed or stopped transmitting spent their last week of life predominantly on grouse moors. 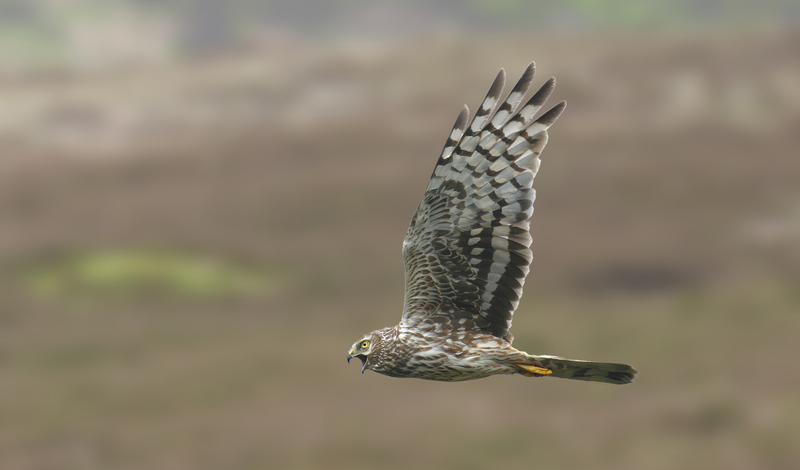 Put another way, hen harriers were 10 times more likely to disappear or die when grouse moors dominated their ranges. A hen harrier flying over a British grouse moor. Image by Richard Saunders. Moreover, this increased disappearance of birds is apparently happening only in certain parts of the UK. A similar study that tracked Montagu’s harriers (Circus pygargus) in Spain using the same type of transmitters found that the survival rate of year-old harriers was about 50 percent. Although the data still aren’t direct evidence, the authors argue that there really is no other explanation. If the birds were not being killed, they write in their paper, what else could explain the meager 17 percent survival rate in their first year of life compared the much higher rate for Montagu’s harriers in Spain or the 37 to 54 percent survival rate of hen harriers in the Scottish Orkney Islands, where there are no managed grouse moors? The harriers’ natural predators, including golden eagles and red foxes, are rarely found on managed grouse moors. If these, or other natural predators, or even wind turbines, killed the birds, volunteers would be able to find their carcasses, with the transmitters. However, the tags of 38 birds simply stopped transmitting with no prior indication of malfunction, and none of the carcasses or tags were ever found. The birds simply vanished. It is highly unlikely that such a disappearance could be attributed to natural causes. A hen harrier with a tracking tag. Image courtesy of the authors. Transmitters do malfunction, but rarely at the scale of such a large number of animals. And again, either the birds would still be alive and could be identified by their tags, or they were dead and transmitters could have been recovered. Neither of these happened. The researchers did detect malfunction of several of the hen harriers’ transmitters, but these cases were always preceded by abnormal functioning, detected by diagnostic plots. Three carcasses that were recovered with their tags and transmitters intact were the only direct evidence of illegal killings, as the birds had been shot in the legs, and presumably could still fly a short distance, away from the hunters, before succumbing. In addition, the chance of harriers dying or disappearing increased tremendously in areas, even protected areas, where land was managed for grouse. 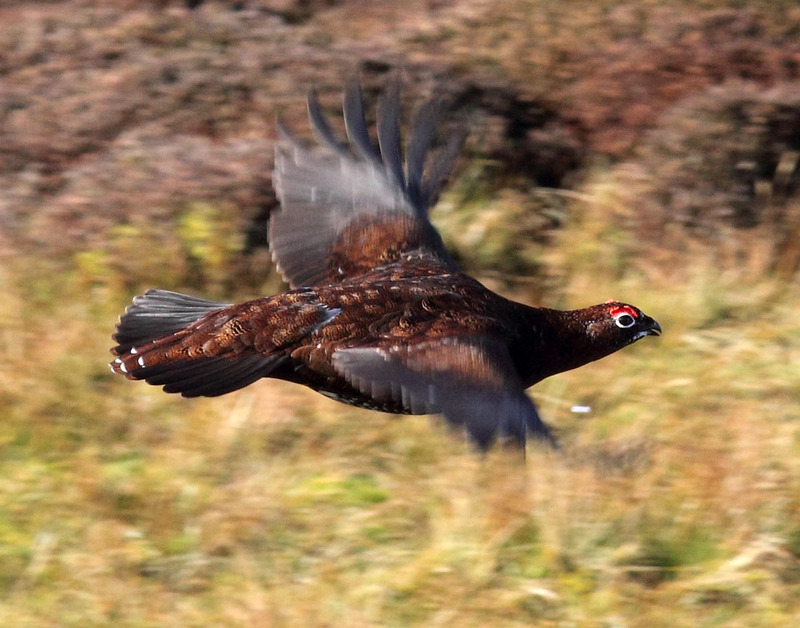 “We can think of no alternative, plausible explanation as to why mortality and unexpected tag failure was occurring at a higher rate on grouse moors,” write the authors. There is no other explanation that fits all these observations, they add. The study adds tremendously to the long-standing suspicion of hen harriers being killed illegally over grouse moors. It does not, however, specifically address potential solutions, and the question remains as to what can be done about it. One potential solution is being tested on golden eagles, another bird of prey that has been a victim of illegal killings. The eagles are being fitted with new tracking tags that can detect unusual behavior and provide locations with greater accuracy. This technology could potentially be adapted for use with hen harriers too. 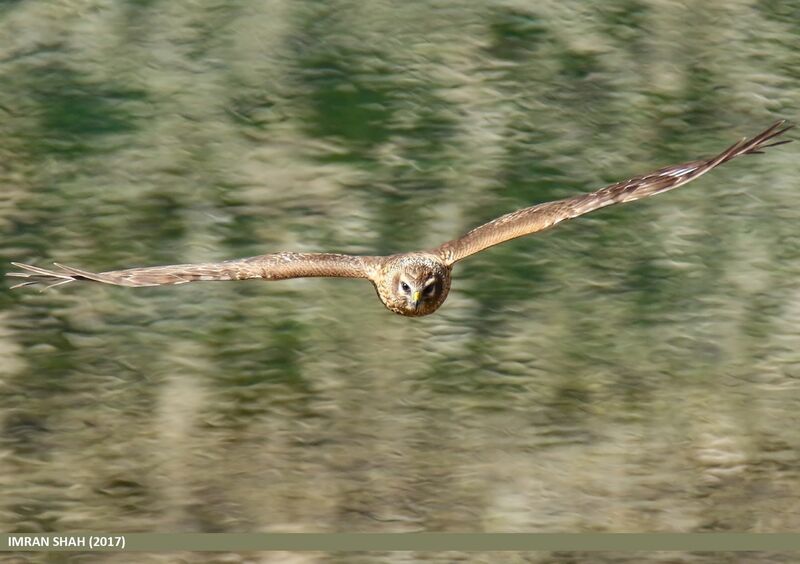 Hen harrier in flight. Image by Richard Saunders. Murgatroyd, M., Redpath, S. M., Murphy, S. G., Douglas, D. J., Saunders, R., & Amar, A. (2019). 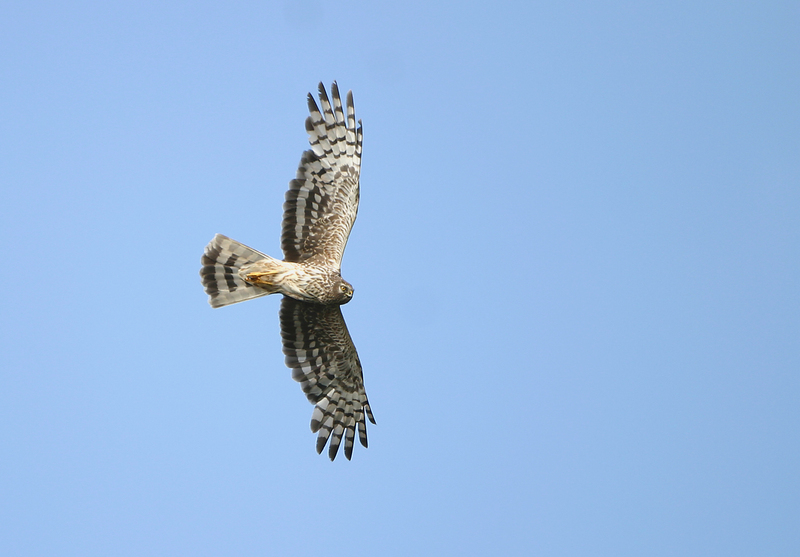 Patterns of satellite tagged hen harrier disappearances suggest widespread illegal killing on British grouse moors. Nature Communications, 10(1), 1094. https://doi.org/10.1038/s41467-019-09044-w.